Andy Whitfield—who played the Thracian slave in the TV series Spartacus: Blood and Sand—lost his battle with non-Hodgkin lymphoma at the age of 39, 18 months after being diagnosed with the cancer. 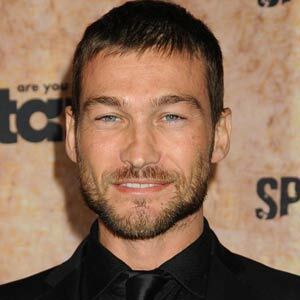 Spartacus: Blood and Sand star Andy Whitfield has died. The 39-year-old star—who played the Thracian slave in the TV series—lost his battle with non-Hodgkin lymphoma at the age of 39, 18 months after being diagnosed with the cancer. His wife Vashti issued a statement yesterday (September 11) explaining he died on a "sunny Sydney morning" in the "arms of his loving wife." The announcement said: "On a beautiful sunny Sydney spring morning, surrounded by his family, in the arms of his loving wife, our beautiful young warrior Andy Whitfield lost his 18-month battle with lymphoma cancer. "He passed peacefully surrounded by love. Thank you to all his fans whose love and support have help carry him to this point. He will be remembered as the inspiring, courageous and gentle man, father and husband he was." Chris Albrecht, president and CEO of Andy’s TV network Starz, released a statement describing him as an "inspiration to us all" and praising him for his "courage, strength and grace" during his battle with cancer. The statement said: "We were fortunate to have worked with Andy in Spartacus and came to know that the man who played a champion on-screen was also a champion in his own life. "Andy was an inspiration to all of us as he faced this very personal battle with courage, strength and grace. "Our thoughts and prayers are with his family during this difficult time. He will live on in the hearts of his family, friends and fans." The Welsh actor was preparing to shoot the second series when he was diagnosed with cancer, and while waiting for his expected recovery the network produced prequel Spartacus: Gods of the Arena, in which Andy had a voice-over role. In January, Starz announced that Liam McIntyre would take Andy’s role on Spartacus... after his condition started to worsen.